For clarification: This RDA was sent to me by Cthulumod as I won their Giveaway here on ECR, this is my first Cthulumod product, hopefully not the last one. This was about 2 Months ago, it arrived in Austria about two weeks later, however, our glorious customs held on it for a whooping four weeks until forwarding the RDA to me. For this reason, my review of it is kind of late, also, this is my first review of anything ever. Furthermore, I want to apologize in advance for grammatical errors, as English is not my first language. I will give my honest opinion as if I had bought it with my own money. 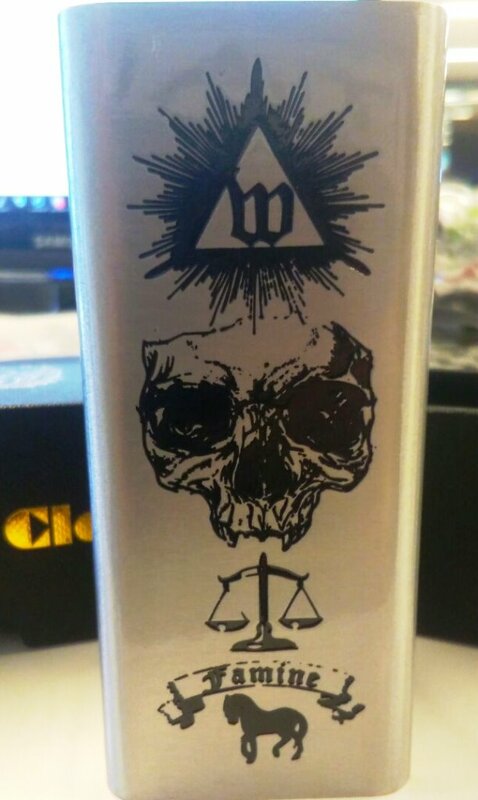 Thanks to Cthulumod for providing me with this interesting Atty. I quit cigarettes in 2016 thanks to vaping, since then I have built a solid collection and now feel informed enough to review something. The Iris Mesh RDA is made out of stainless steel, I normally don’t really care for the looks of RDA’s but this one looks different, and I like it. The holes in the AFC rings give it a rugged look and the hard corners on it are kind of refreshing to look at. The 2 drip tips serve an option for ultem lovers and haters, but you can use all your favorite 810 drip tips on it. You can’t really say you’re building because all you have to do it cut the mesh to size, take a look at how high the posts are for a perfect measurement, install it with the 4 screws (2 per post) and wick it up. I just installed one side of the mesh strip before shoving in the cotton, then pulled the mesh around it. While holding the mesh in place I installed the other end and was good to go. Note that the cotton has to end flush with the top of the mesh, otherwise you choke off the airflow. The deck is really interesting, the positive post is movable when you unscrew the 510 pin, allowing to switch between dual and single coil setting. For dual coil, the post are pretty much facing each other. For single coil, they are next to each other. The squonking option is really well thought out, you get a squonk post, a hollow post with holes on three positions, that screws onto the squonk pin. Since the coil setup is vertical, this is needed to be able to saturate the massive amount of cotton. It made me happy in the first moment as the airflow is very smooth, and there is no whistle of any kind. Whistling RDA’s drive me insane (looking at you, whistle nano). The Flavor is, as expected, up there with all the other Mesh RDA’s, I own the VV Mesh RDA, and the flavor is comparable, but the draw is much smoother. Also unlike the VV Mesh, the IRIS actually has a juice well, thank god because it’s somewhat thirsty RDA. I vaped the IRIS RDA with single mesh, dual mesh and a strange vertical coil build, and aside from the latter it vaped fantastic. I dig the flavor and the vapor is dense as can be. The squonking post works beautifully, I prefer to use this as a Dripper though because of the one gripe I have with this atty. Juice condensation in the AFC Ring, it is really minor, but it’s there. And since I spend half of my days driving, getting tiny amounts of juice on my fingers everytime I touch the RDA is annoying me. This might be just me though. This is the best mesh atty I have ever used and I love to use it on my broadside mech as well as on the Tesla Steampunk because the looks of those two are made for each other. Thanks again to cthulumod for this great atty!! It really earned a place in my vape rotation.